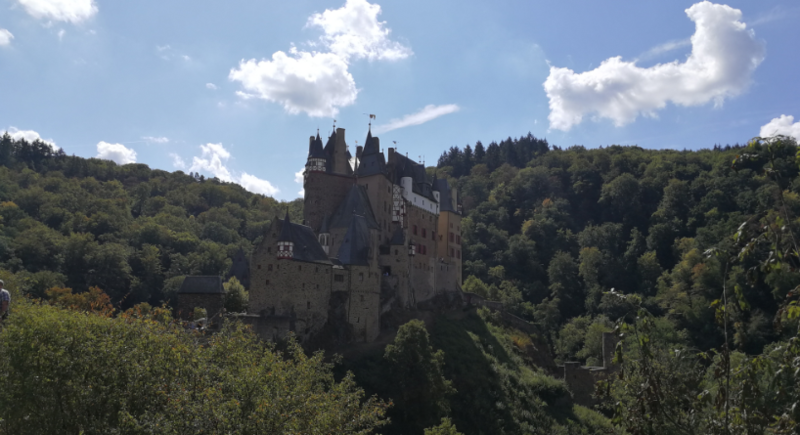 We visited Burg Eltz on a nice, sunny day. It is a 1 hour and 45 minutes drive from our hometown Aachen in Germany. Perfect for a quick visit of approx 2 hours to enjoy the scenery! The best way to get there is by car, but there are also public and tour buses going to the castle sight. Know that if you come by car, you can park nearby. There is a footpath taking you to the castle, which is a 15 minute walk. For less able people there is also a shuttle bus going back and forth to the castle entrance and the parking lot, for € 2,- per ride per person. Parking is around € 2.50 per car. You can do a lot of activities inside the castle, but because of the crowd we decided not to wait in the Que. For the activities, check their website here. This blog will be about the views from outside, which alone is worth the trip! After you walked down the path, you will get a glimpse of the castle from far. The shot is just amazing. And walk down a bit more, a cool picture can be taken from an angle just a bit more too the right ;-). Once in front of the castle, you can get another amazing shot. Inside there is a restaurant (not for budget travelers ;-)) and you can purchase tickets for a guided tour. You can freely walk around and see the inside walls of the castle, which are pretty amazing by itself too. And so is the view from inside the castle. No doubt, Eltz castle is one of the most beautiful castles in Germany and perhaps even in Europe. If you got the chance, be sure to make a stop!